Chris Birch was only 7 when he first threw a leg over a motorcycle. His passion for 2 wheels did not start there though; he had always been keen on riding bikes, from the day his stabilisers were removed to his first BMX and the thrill of jumping off a ramp made of a plank of wood and a few bricks. How this all started...At the age of 12 Chris' parents took him to a local motocross (MX) track near to Newmarket, Suffolk. Here he experienced his first ever taste of motocross and was immediately hooked. A few months later Chris got his first motocross bike; all be it a 1973 Bultaco 250cc but a bike's a bike. Chris honed his riding skills on local farmers’ fields and then progressed to the local MX tracks. For his 13th birthday Chris got what he had been dreaming of - a more up to date MX bike, a Suzuki RM125. By riding motocross almost every weekend he quickly improved. Chris did race but nowhere near as often as he wanted to because of the financial cost involved. His parents could not afford to support him as much as they would have liked to. Chris did a morning paper round to earn money to put towards the running of his bike and as soon as he was able to he started working the weekends at his local MX track as a marshal. This allowed him to practice free of charge once a week after school and for one hour after opening hours at the track on the weekends. In 1999 Andy Godbold visited the track looking for riders to join his Lings Honda motocross display team. Although Chris was still only 15 at the time he went along for a trial. He stood out from the rest by a mile. 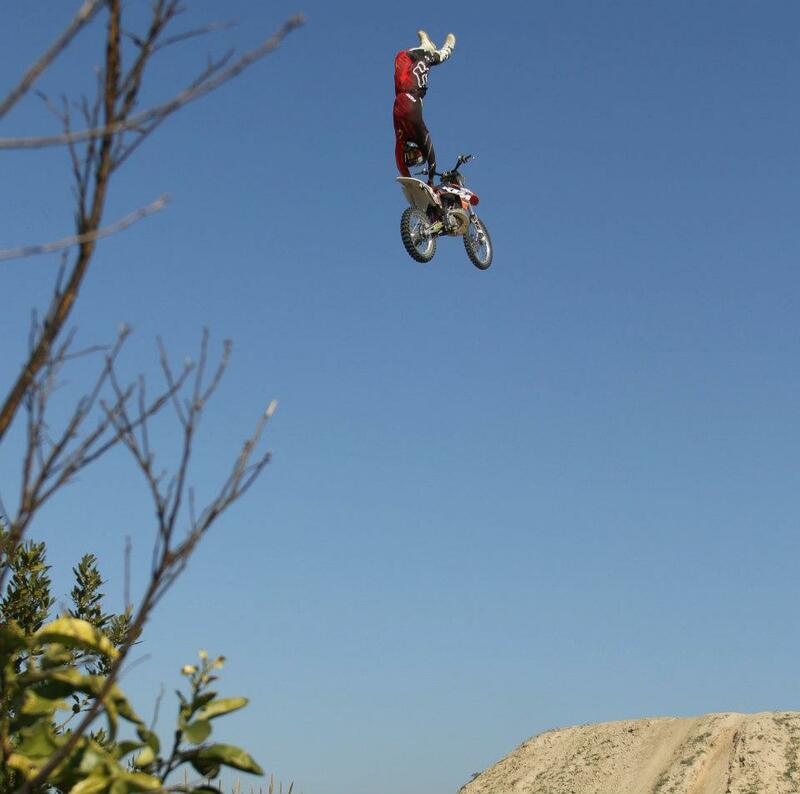 He was the youngest and showed a lot of skill by successfully completing a 45ft ramp to dirt jump, which he was later told a lot of the older and experienced riders refused to try. Andy saw Chris’ potential and offered him the opportunity to join and train with his team. Two months later Chris was away at the weekends performing in Royal and County Shows up and down the country. As the years past Chris was shining in the team and, as interest in Freestyle Motocross (FMX) started to grow in Europe, the ramps got bigger, the jumps got longer and the tricks even more spectacular. In 2002 Chris competed in Airwars 2 in Sheffield, the second ever FMX contest in the UK. He finished in 2nd place in the British championship and 7th overall in the International. In 2003, and only 19 years old, Chris started to travel to Europe to take part in the IFMXF (International Freestyle MotoX Federation) competitions. Although never achieving the top few places Chris became known throughout Europe as a very respected. In 2005 Chris signed for Jimmy Verburgh's Belgium team FMX4Ever. He has travelled all over the world competing in some of the biggest FMX events and taking FMX to countries where it has never been seen before! Chris moved to Belgium to focus on his sport and spends the winter months in the south of Spain so that he can continue his training all year round. Since 2007 Chris has been a main rider in the Red Bull X-Fighters Exhibition tours. In 2009 he was one of the four riders who gave a FMX demonstration in front of one of the seven wonders of the world the pyramids in Giza. He also competed in the Red Bull X-Fighters World tour at Battersea Power station in 2009 and 2010. 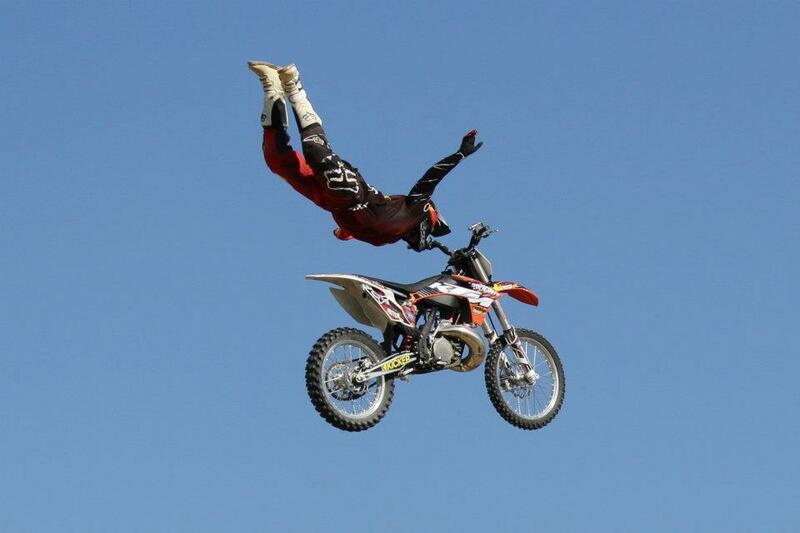 Chris has been considered for years to be Britain's number one freestyle motocross rider. He has a great reputation in the business and in June 2011 confirmed that status as British number one by winning the Bolddog FMX British Championship!